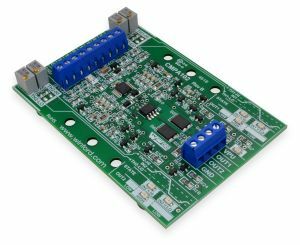 The CMPA102 comparator board provides two channels of comparator functions with a non-inverting open-drain protected output for each channel. Hysteresis is easily controlled with separate high and low threshold voltages. Each threshold may be set using the onboard potentiometers, or thresholds may be provided externally by the user. Input signal range includes the input-side supply rail and ground, without the need to use voltage dividers. The CMPA102 is suitable for use with supply voltages of anywhere from 3.3V to 24V. This robust design includes protected low-side output drivers that provide significant sink current capability. Reverse-polarity protection on inputs and outputs is also included. 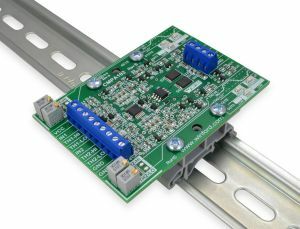 This board includes terminal blocks to provide convenient access to the signals. 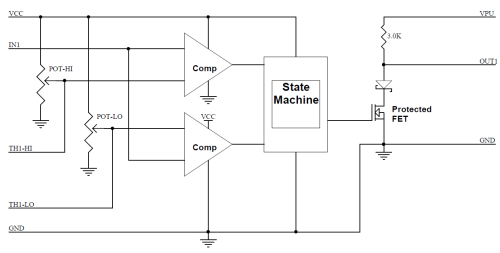 A comparator is sometimes referred to as a "threshold detector" or "hysteretic controller." Approximate dimensions: 3.3" x 2.3"